The power developed by an engine as measured by the force applied to a friction brake or by an absorption dynamometer applied to the shaft or flywheel. Abbreviated bhp. 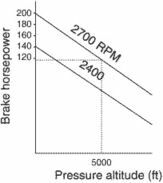 Typical variation of brake horse power with altitude for given RPM values. The power delivered to the propeller shaft (main drive or main output) of an aircraft engine. It is the difference between the horsepower delivered by the engine and that consumed by friction. The actual horsepower received by the propeller of an aircraft. Brake horsepower decreases with altitude. See also brake mean effective pressure. For centrifugal chillers, the system would have required 12-inch headers and 25-hp pumps for a brake horsepower of 22. The engine, which is scheduled for delivery in the second half of 1999, will provide 6,192 brake horsepower to drive a four-megawatt electrical generating system for the city of Sabetha, Kansas. The Volvo V90 Cross Country luxury estate wagon will use a 2-litre diesel engine that produces 235 brake horsepower and 480Nm torque, and will use an 8-speed AWD automatic transmission. NEARLY 3,000 brake horsepower will be on display when the Performance Car Show pulls in to the NEC next week. 6-litre, 103 brake horsepower petrol through to 160 brake horsepowered, 2. If we had a wire-to-shaft efficiency furnished either by the VFD or motor manufacturer, any engineer could take the brake horsepower required by the fan, pump, compressor, etc. 9DTI Superb, which offers 105 brake horsepower, will get 55 miles to the gallon. Hoy, who won gold in the keirin, sprint and team sprint in Beijing, added:" I can kick out about two and a half brake horsepower so that's not going to quite match his car but I think they'll make the race as close as possible and I'll be giving it absolutely everything. Matt Neal will happily have his feet back on terra firma when he trades the thrills of wind power for brake horsepower at Snetterton this weekend. There are also changes to the most powerful of the petrol engines with the T5 gaining an additional ten brake horsepower to take it up to 230bhp whilst the D5 will gain a six-speed manual transmission option later in the year. That number 138 relates to the brake horsepower figure and when you actor in the amount of torque - or pulling power-available there's plenty o like about this model, even if it is in he higher reaches of the price range. The pump is not going to pump any more water just because you have increased the brake horsepower of the motor.